Basically, it allows you to set an interval and duration for each station. In the above example, stations 1 and 2 are scheduled to be on for 20 seconds every 4 hours, stations 3 and 4 are scheduled to be on for 20 seconds every 6 hours, and the remaining four stations are scheduled to be on for 5 minutes every 50 minutes. So it’s pretty simple. An added feature is that if more than 1 stations are scheduled to be on at the same time, they will be serialized: in other words, the controller will turn on each station one after another instead of simultaneously. The serialization is activated by setting the Multi-Station value to 0. The program is still in a primitive state, and I am working to strengthen it so that it can support a weekly schedule. Basically, the idea is to allow the user to add any number of schedule items, where each item contains a list of selected stations, days in a week, start time, end time, interval, and duration. For example, you can specify an item like ‘schedule stations 1, 2 and 5 for every Monday and Wednesday, start at 8am and end at 6pm, turn them on for 5 minutes every 4 hours’. You can add as many schedule items as you want, or modify them later. This will make the OpenSprinkler schedule algorithm significantly more flexible and powerful. So stay tuned! Yup, you heard it right, version 1.2u of OpenSprinkler will debut at Maker Faire Bay Area on May 19 and 20. 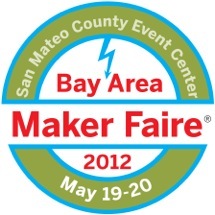 If you are going to Maker Faire, you are welcome to drop by and see our live demos. I started working on v1.2u shortly after releasing v1.1, and we were lucky to get the PCBs and components just in time for Maker Faire. 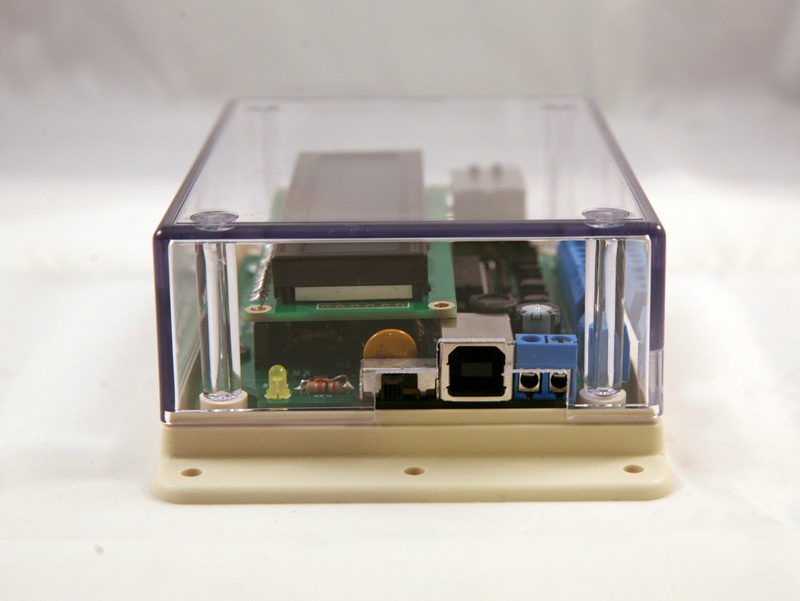 The PCBs and components are shipped directly there, so it is not yet available for online purchase until May 23. But it is available for purchase at the Maker Faire and will be available online shortly after that. So what’s new in this version? The main improvement is an on-board USB programmer. 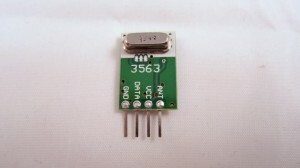 Specifically it’s a USBtiny ISP programmer built on a pre-programmed ATtiny45. 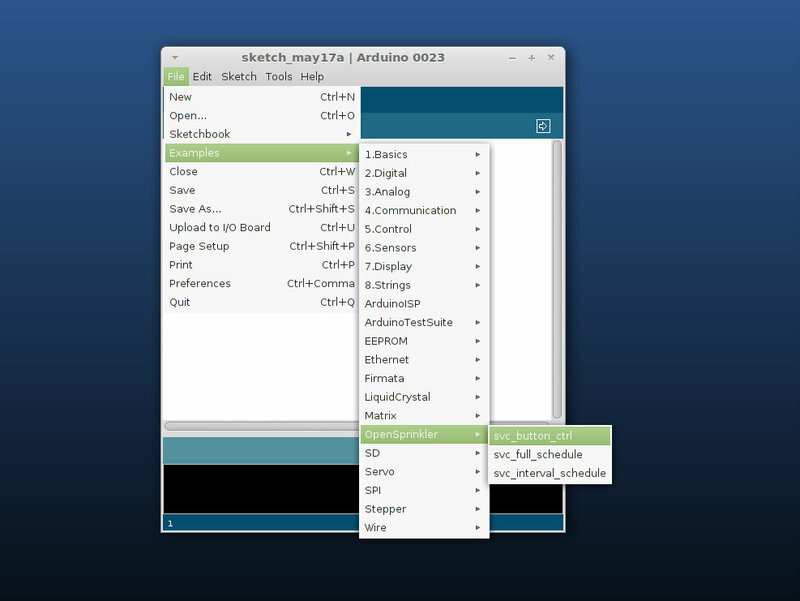 USBtiny is one among many choices to directly program an AVR microcontroller without using a bootloader. The main advantages are that it is low cost (costs just a couple of dollars) and it enables the entire program space on ATmega328 (since no bootloader is needed). 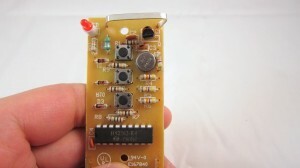 It is based on a post by Tequals0 and this version makes use of the internal clock and PLL on ATtiny45 to implement USBtiny with only three external resistors. Very elegant. With the on-board USB programmer, you don’t need any external programmer any more. Note that this version is named v1.2u, where u refers to the USB connectivity. 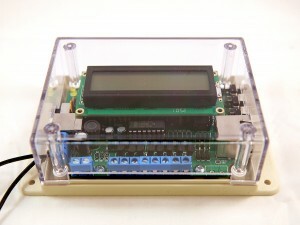 The second change is that some components have been replaced to adopt more common parts, including the switching regulator, the Ethernet jack, and the LCD. Also, there is now a rain sensor screw terminal, and a pinout for sensing power loss. The program will be updated to support these features soon. Another change is that the LCD pin assignment is slightly modified to free up analog pin 1, which is useful for talking to sensors. Finally, the extension board connector is also updated to use more common 2×3 pin header and cable. Note that this is still compatible with the previous version of extension board. If you have the previous version of extension board, it still works with v1.2u by switching a pin on the extension cable. If you are interested, check the detailed release notes here and the release video below. Note: the RF transmitter used in this article is available for purchase in the shop page. In a previous post I described a way to use an Arduino to interface with remote controlled power sockets. 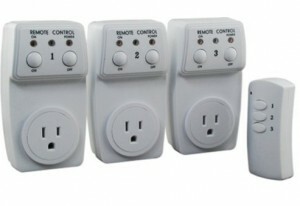 The idea was to make use of the original remote control, and a high-side transistor switch to simulate button presses. This approach is generic: you don’t need to know how the remote control signal is encoded, instead, just treat the remote control as a black box and simulate the button presses. However, the downside of this approach is that it requires soldering wires and components to the remote control, which is quite a bit of work. Recently, inspired by the JeeLabs KAKU remote switch article, I figured out a new way to interface with these remote power switches. The method published by JeeLabs uses an RFM12B transceiver, which is cool because my OpenSprinkler design has a reserved spot for RFM12B. Unfortunately after many experiments I was unable to get it to work with my switches. However, I did succeed by using a 433MHz RF transmitter purchased from SparkFun. So below I document the process of how I did it. To begin, I took apart the remote control. The goal is to reverse engineering the signal sent from the remote control, so that I can use an Arduino to simulate the same signal. This will allow me to use a program to control the power sockets. 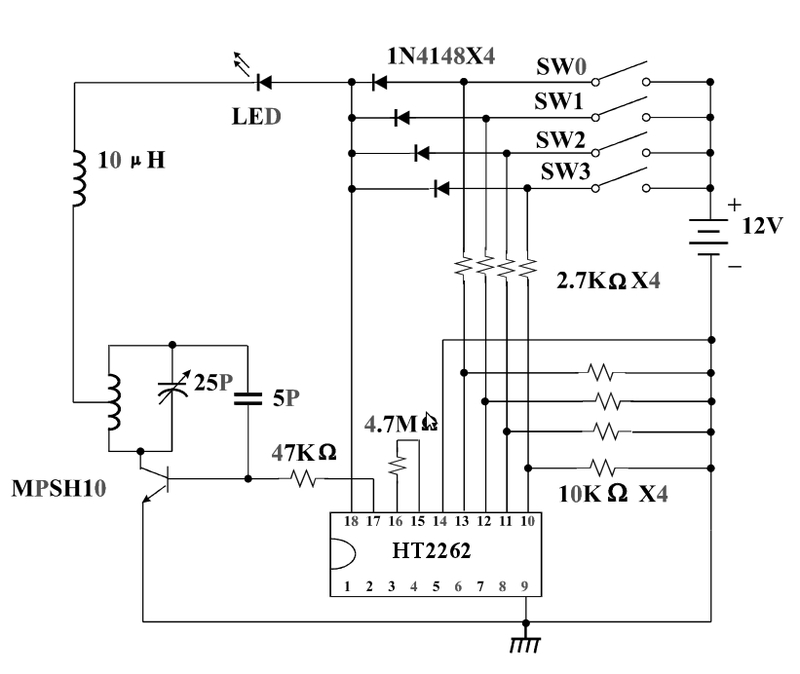 The schematic of the remote control circuit can be found in the previous post. Basically it consists of an encoder IC (HT2262 or PT2262) and a 433MHz RF transmitter circuit. 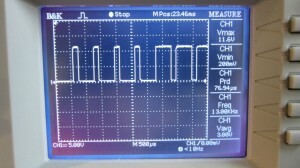 By connecting an oscilloscope to the circuit I was able to analyze the signal patterns. Details can be found in the video attached at the end of this post. Below are the patterns I observed when button 1 is pressed (corresponding to power socket 1). The signal consists of two basic patterns: a short HIGH followed by a long LOW, which I call a ‘0’ all together, and a long HIGH followed by a short LOW, which I call ‘1’. The long part is roughly 500us and the short part is roughly 160us (so it’s about a 3:1 ratio). Each signal sequence consists of 25 bits: the first 16 bits are always ‘0000 1111 0101 0101’, which I call the ‘signature’; and the next 8 bits are the ‘command’, which correspond to the index of the power socket; finally, there is always an ending ‘0’. Again, a ‘1’ means a 500us HIGH followed by a 160us LOW, and a ‘0’ means a 160us HIGH followed by a 500us LOW. When a button is pressed, the sequence is repeated several times, for robustness I guess. Next, to simulate the remote control signal using an Arduino, I used a 434MHz RF transmitter from SparkFun. 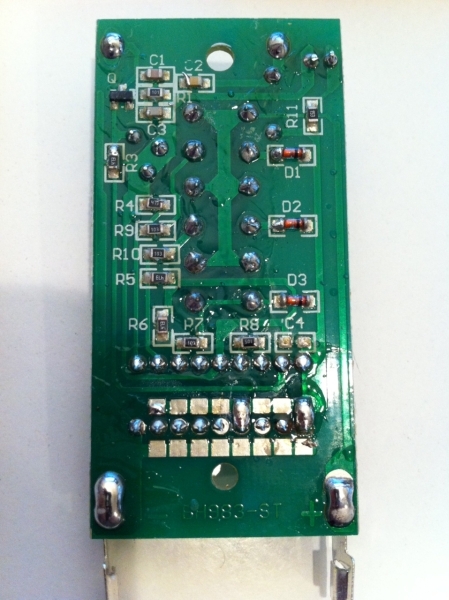 This transmitter has only 4 pins: Gnd, Vcc, Antenna, and Data. 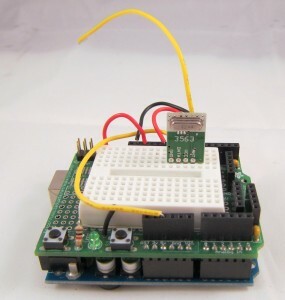 The data pin can be connected to any digital pin on the Arduino in order to send the control sequence as analyzed above. For demonstration, I used Arduino pin 10 to send the control sequence through the Data pin. 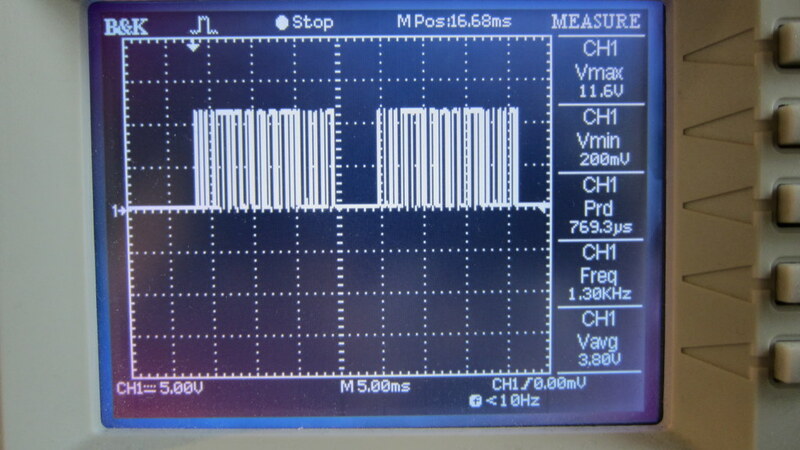 The connection is as follows: VCC->+5V, GND->GND, DATA->Digital 10, ANT->a short wire. 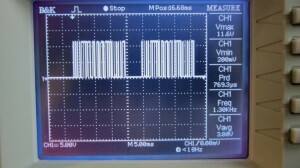 The supply voltage for the RF transmitter can be anywhere between 1.5V to 12V. The higher the voltage, the longer the transmission range. Normally 5V should be good for at least 15-20 meters. If you want the highest range, use a +12V power adapter to power your Arduino, and connect the RF transmitter Vcc pin to the Arduino VIN pin. Alternatively, you can add a voltage boost converter to bump +5V to +12V. Below you can download the Arduino program I wrote. The code should be easy to follow. Credits: the method is based on JeeLabs KAKU remote switch and the code is based on the kaku_demo sketch included in their RF12 Arduino library. 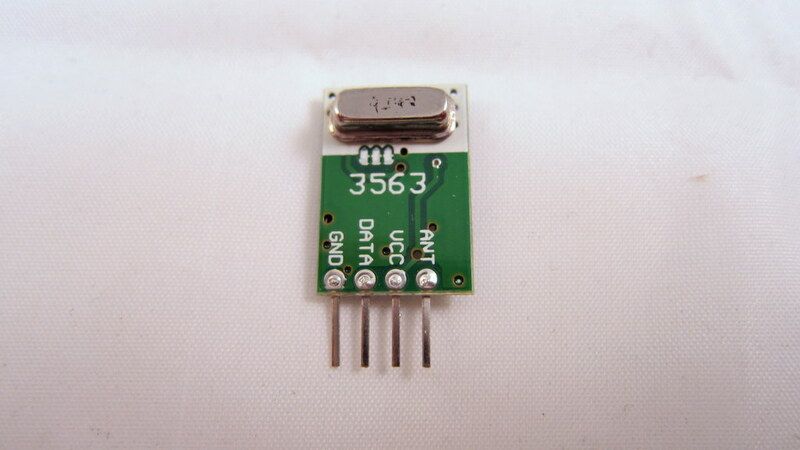 Note: the RF transmitter (434MHz) is available for purchase in the shop page. Update 1: apparently if you look at the datasheet of PT2262, which I found a copy here, it explains how the encoding pattern is computed. The ‘signature’ part has to do with the status of each pin from A0 to A7 on PT2262 – whether the pin is connected to GND, VCC, or floating, and the ‘command’ part is determined by the status of each pin from D0 to D3. 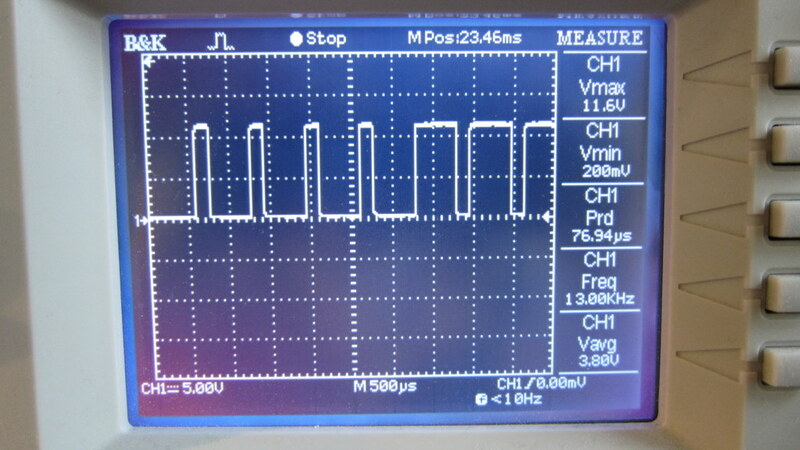 I compared the circuit with the datasheet and verified that the pattern I observed from the oscilloscope matches the calculation. Also, according to the datasheet and the resistor value I found on the remote control, it looks like the long delay should be about 400us and short delay 133us, which is a bit different from the 500us and 160us observed from the oscilloscope. Also, the ending ‘0’ in my sequence turns out to be a ‘sync’ bit, which is 133us high followed by 4200us low. The fact that my original sketch has worked means there is a some level of tolerance in the timings. So they do not have to be highly accurate. More technically, the coding pattern can be derived from the connections of Pins 0-7 of PT2262. In the newer version (from the PCB image on the left), the first 4 pins are connected as HIGH, FLOAT, FLOAT, HIGH, whereas the older version is connected as LOW, LOW, HIGH, HIGH. Here HIGH means connected to Vcc, LOW means connected to Ground, FLOAT means unconnected. Taking a look at the datasheet, you can easily figure out the actual code: LOW -> 00, HIGH -> 11, FLOAT: 01. Chuck sent me his modified code, which you can download here.